In Spring 2018, hundreds of migrants from Central America approached the U.S.-Mexico border seeking asylum in the United States and threatening to enter illegally if their request was denied. Pueblo Sin Fronteras organized the caravan in conjunction with the CARA Family Detention Pro-Bono Project. The CARA coalition consists of the Catholic Legal Immigration Network, the American Immigration Council, the Refugee and Immigrant Center for Education and Legal Services, and the American Immigration Lawyers Association, all groups advocating for legal status for illegal immigrants and expanded immigration overall. These organizations have been funded by a number of major left-of-center grantmaking foundations, including the Open Society Foundations, MacArthur Foundation, Ford Foundation, and Carnegie Corporation of New York. The caravan eventually halted in Mexico City on April 4 instead of reaching the United States border. In 2015, the Catholic Legal Immigration Network, the American Immigration Council, the Refugee and Immigrant Center for Education and Legal Services, and the American Immigration Lawyers Association, collectively known as CARA, joined forces in response to Immigration and Customs Enforcement’s (ICE) significant expansion of its family detention capacity. The opening of the “South Texas Family Residential Center” in Dilley, Texas – with an initial capacity of 480 beds and the potential to hold 2,400 individuals – and the detention of families at the “Karnes Residential Center” in Karnes City – with a current capacity of 532 beds and plans to double the number – reflect the Obama Administration’s continuing commitment to the flawed deterrence policy it began in June 2014 with the opening of a temporary family detention center in Artesia, New Mexico. In early 2016, the pro-bono work at the South Texas Family Residential Center became known as the Dilley Pro-Bono Project (DPBP). DPBP is a collaboration of the American Immigration Council and other partners. It operates a non-traditional pro-bono model of legal services that directly represents detained mothers and children who are fleeing extreme violence in Central America and elsewhere and are seeking asylum in the United States. DPBP is an Immigration Justice Campaign local partner. The detention of children and their mothers is not only inhumane, but incompatible with a fair legal process. The project builds on the volunteer’s collective experiences providing legal services, running a pro-bono project for detained families, training lawyers and BIA accredited representatives, and leading advocacy and litigation efforts to challenge unlawful asylum, detention, and deportation policies. 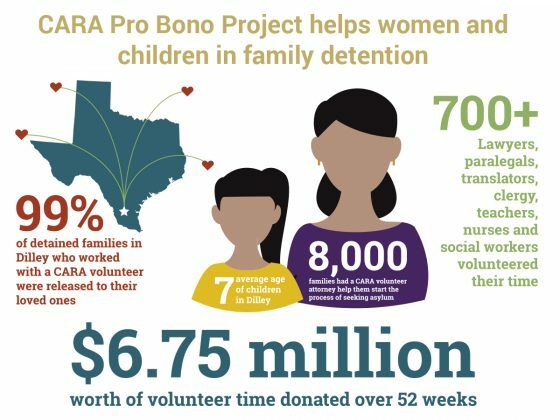 The volunteers behind CARA are committed to ensuring that detained children and their mothers receive competent, pro-bono representation, and developing aggressive, effective advocacy and litigation strategies to end the practice of family detention.